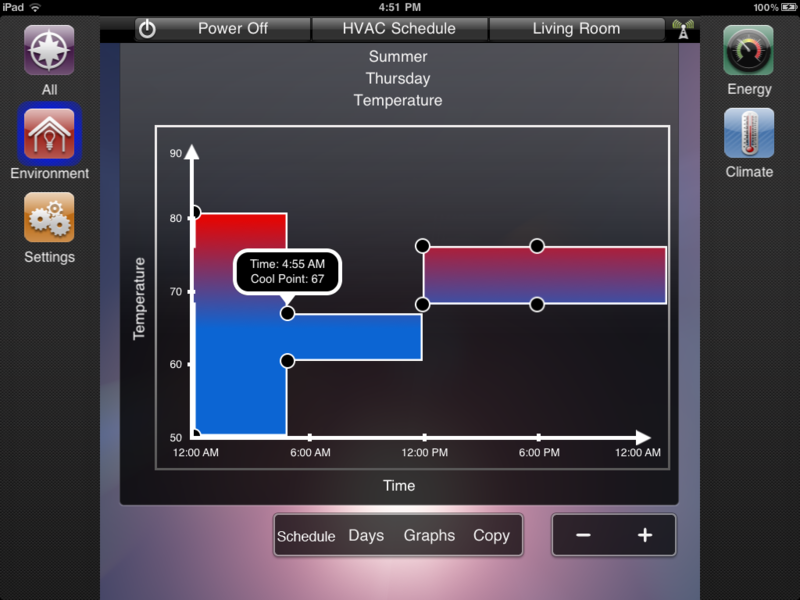 To begin the HVAC Schedule process, access the HVAC main screen as shown below. 1. 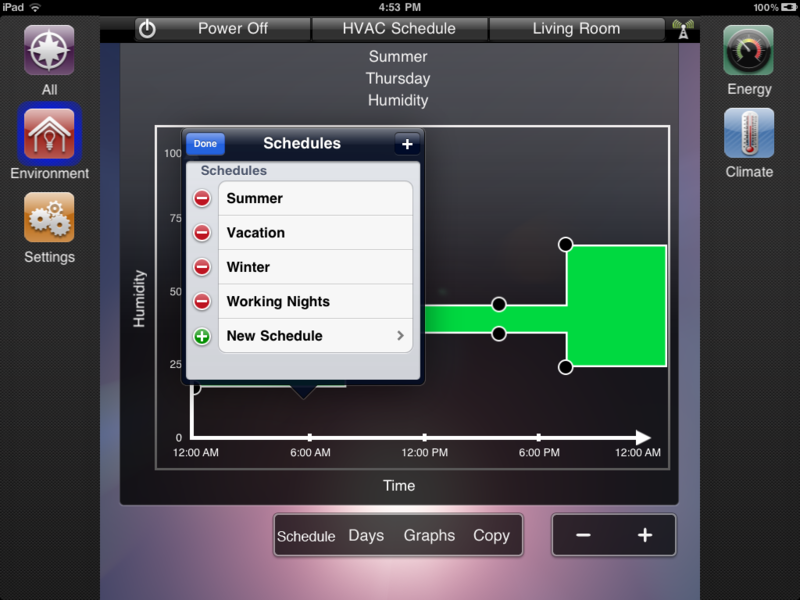 Locate the Schedule icon and schedule setup icon above it at the lower right of the screen as shown below. 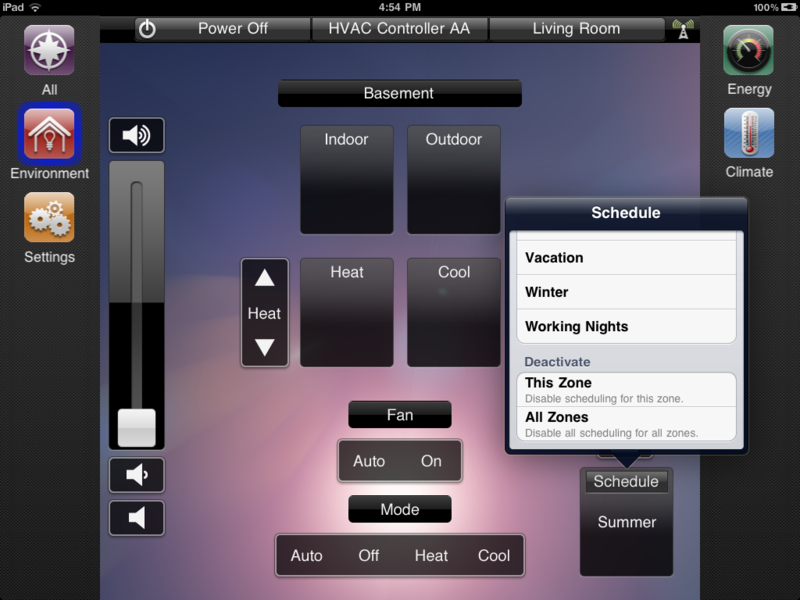 Under Activate for This Zone tap on Summer, Vacation or Winter for the zone shown (Living Room in this example). Under Activate for All Zones tap on Summer, Vacation or Winter for all zones. 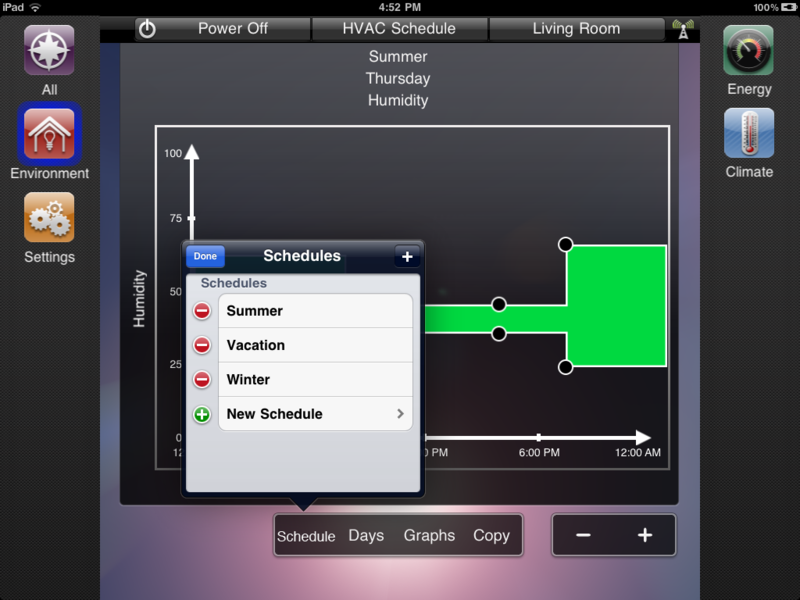 Under Deactivate tap on This Zone to disable scheduling for this zone (Living Room in this example). Note: If this schedule exists in another zone, you must access that zone and repeat the above step. 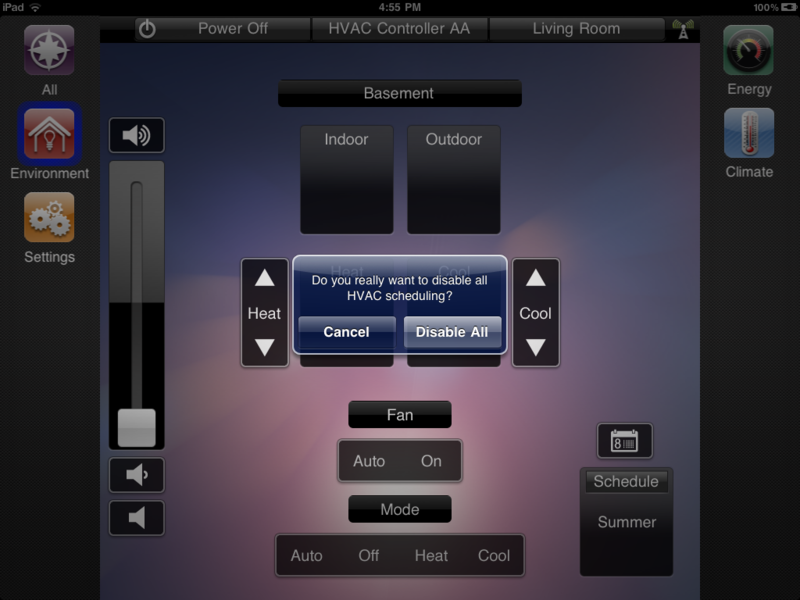 Under Deactivate tap on All Zones to disable scheduling for all zones. Important: The following screen appears when you selected to disable all schedules. 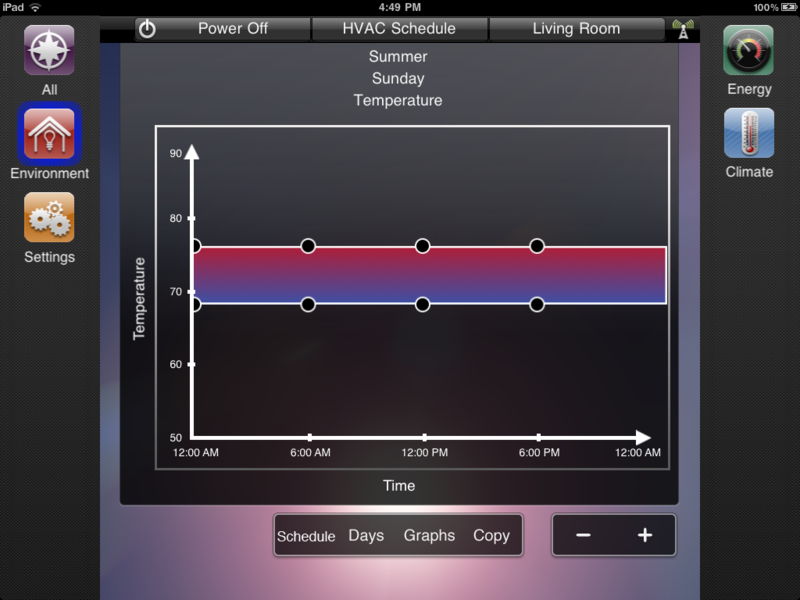 To begin the HVAC schedule process, you can select either the Summer, Vacation, Winter schedule or add a new schedule. 1. 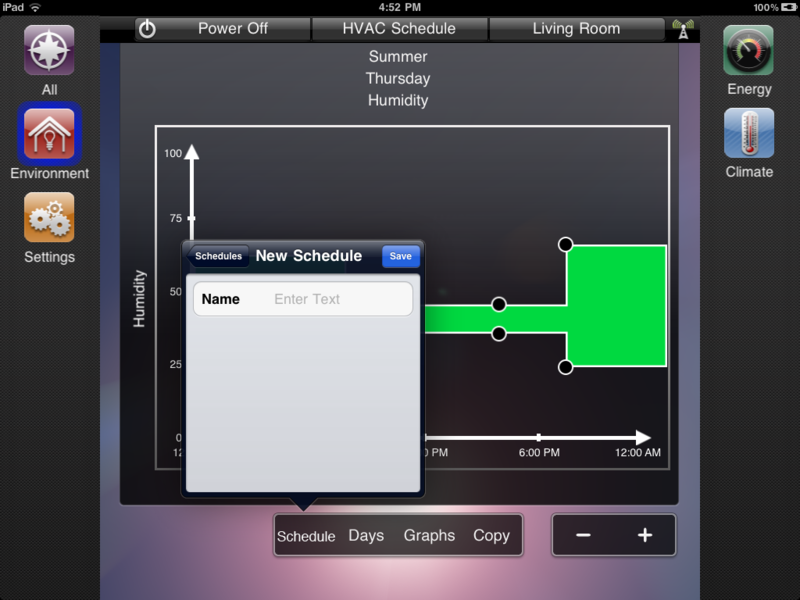 To add a schedule, tap on the icon just above Schedule on the HVAC main screen or tap on Settings > Schedule. 2. 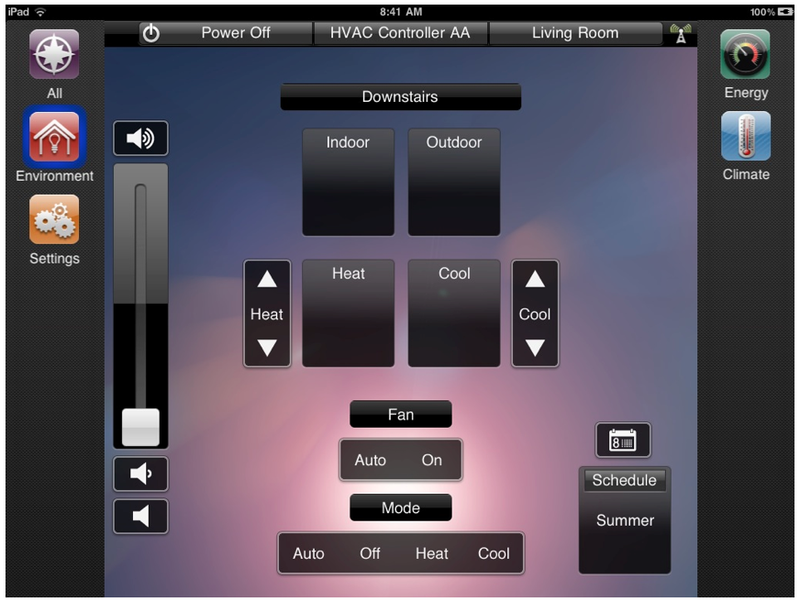 Tap on Schedule at the lower center of the screen to open the screen below. 3. Tap on the + button in the upper right corner to add a new schedule. 4. After tapping the + button, the following popover displays. 5. In the Name field, tap Enter Text. 6. After tapping on Enter Text the following screen displays. 7. 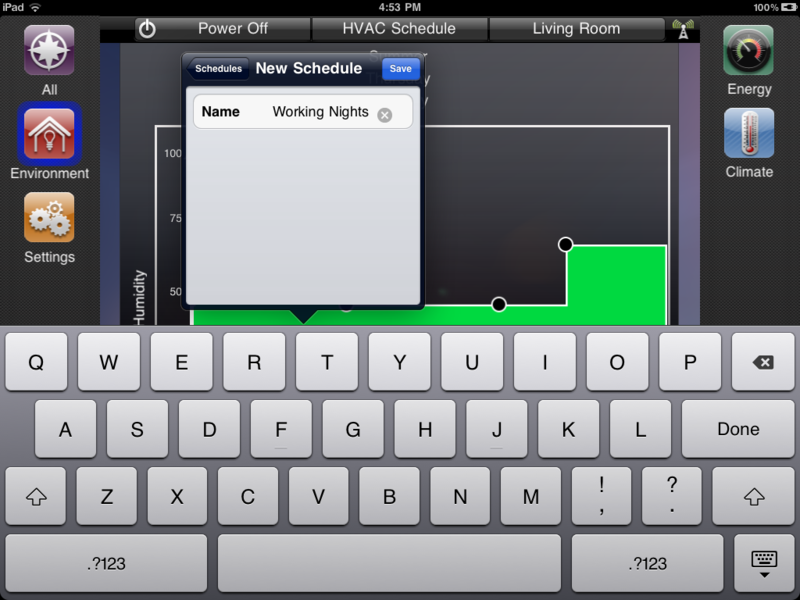 Type in Working Nights as the new schedule name and then tap on Save. 8. After tapping on Save the following popover displays. 9. Tap on Done and then tap on Working Nights. 10. After tapping on Done the following screens show the Working Nights schedule. After selecting the schedule, Summer for example, you can edit the schedule. The Summer selection appears in the Schedule icon as shown below. Editing the schedule may involve changing the schedule day, changing schedule set points and adding and deleting set points. 1. 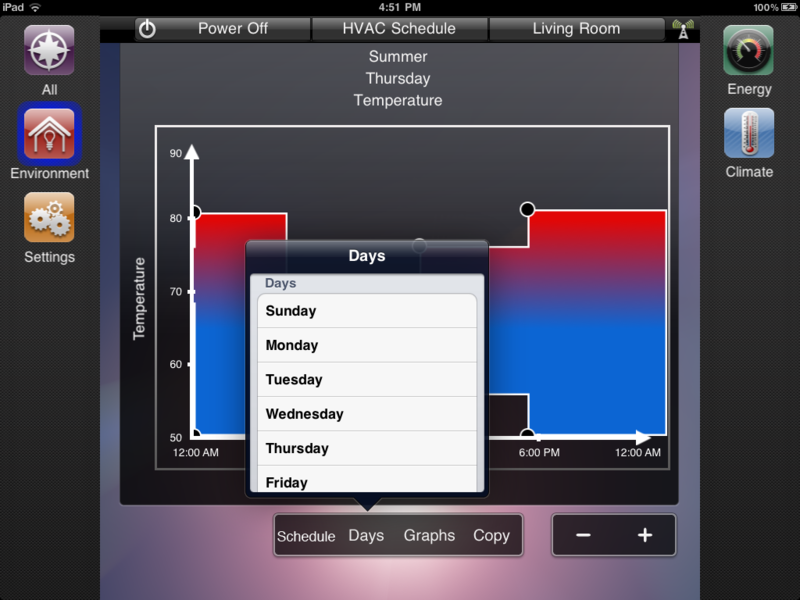 To edit schedules, tap on the icon just above Schedule on the HVAC main screen or tap on Settings > Schedule. 2. 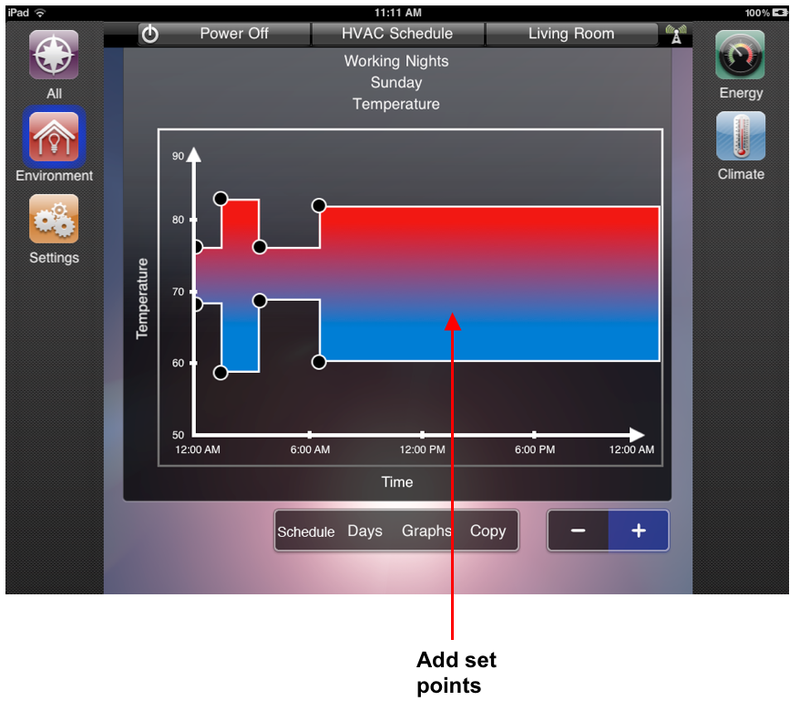 The Temperature (default) graph setup screen opens. 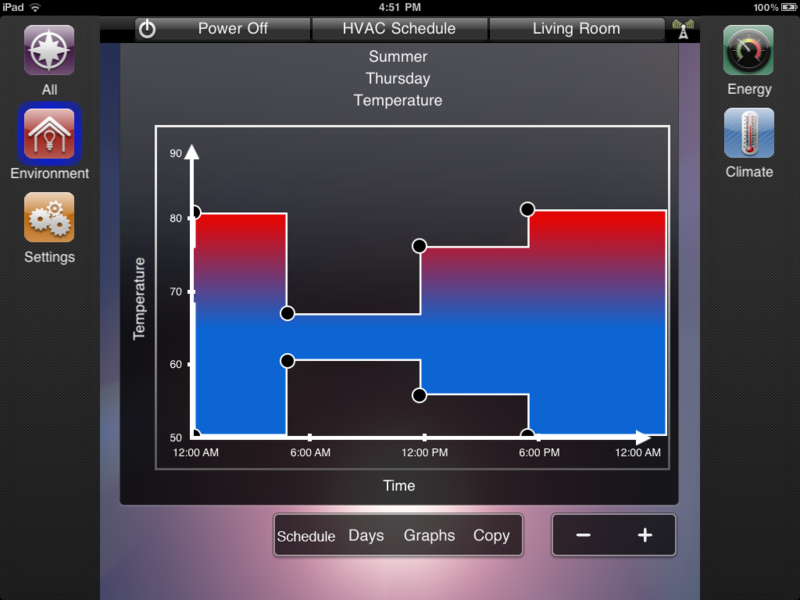 Note: If you want to edit Humidity schedules, tap on Graphs at the lower middle of the screen and select Humidity. Refer to Scheduling Humidity below. 1. 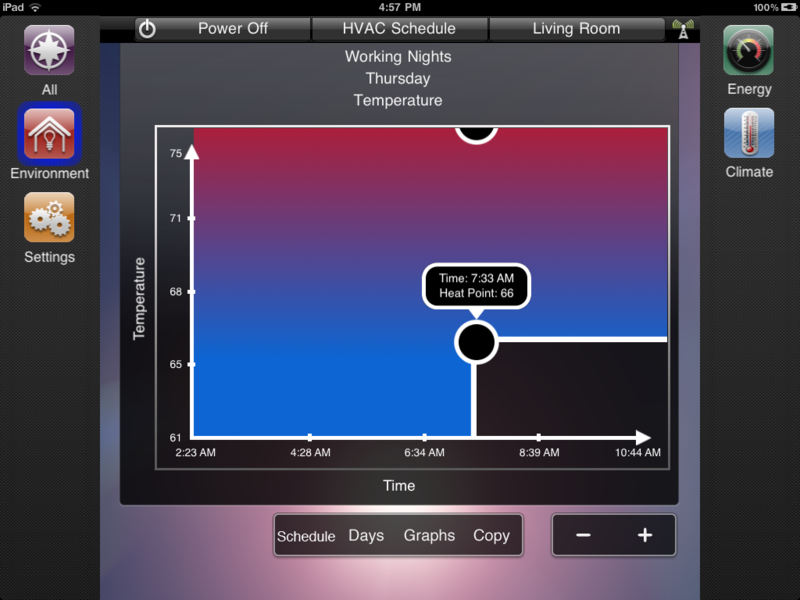 To change the day for a temperature or humidity schedule, tap on Days at the lower center of the screen. As shown below, this popover allows you to select your desired day. 2. After tapping on the desired day. The following screen displays showing the selected day in the schedule (Thursday in this example). 1. 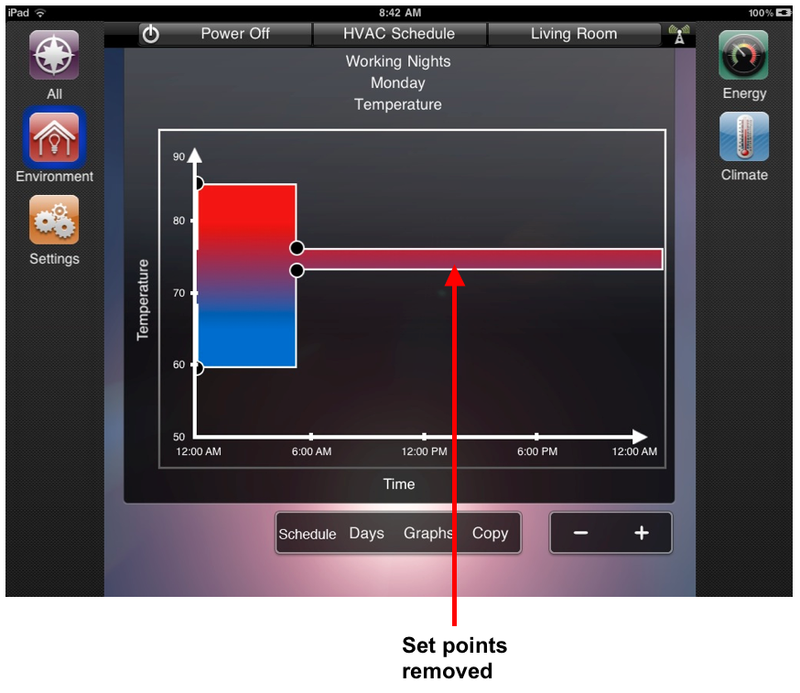 As shown on the screens below, touch and drag the set points to schedule your heating and cooling to turn on and off based on temperatures and time of day. If you need greater accuracy when positioning the set points, use a pinching motion on the graph to zoom in. When you have completed set point positioning, use a pinching motion to zoom out. 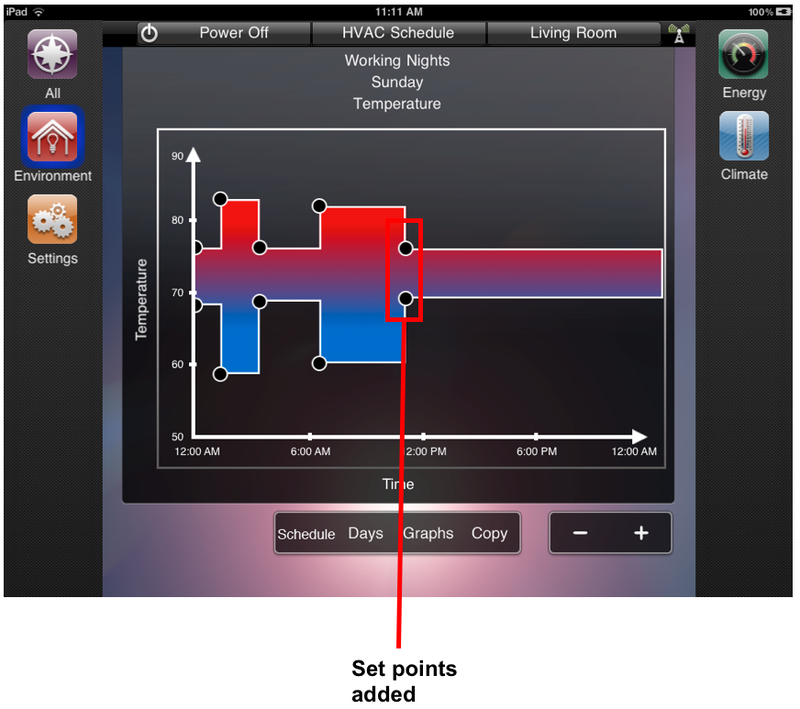 To add set points to the schedule graph, tap on the + sign (goes blue) and then tap the display in the graph area. The + sign goes black after the action is completed. 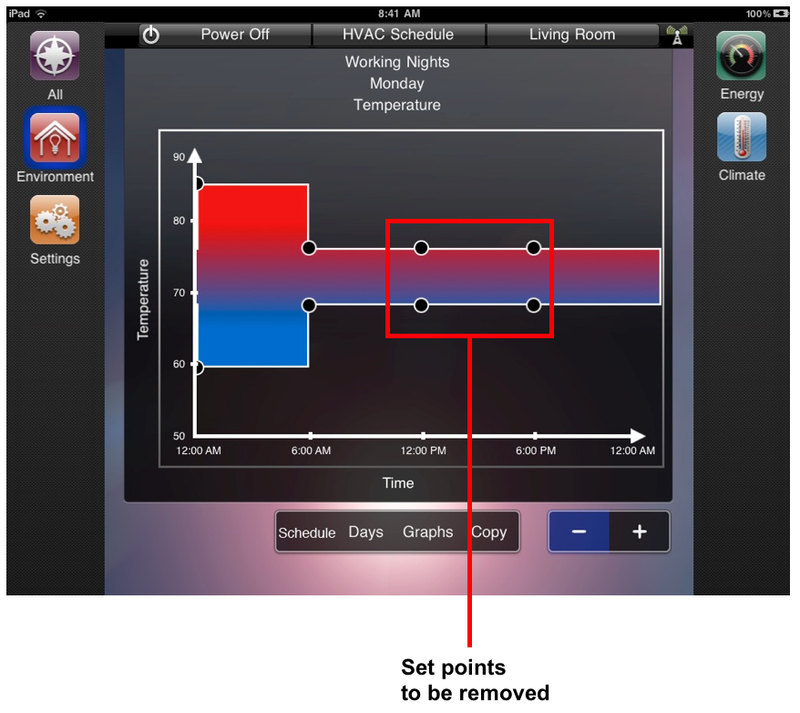 To delete set points to the schedule graph, tap on the - sign (goes blue) and then tap the desired set point. The - sign goes black after the action is completed. 1. 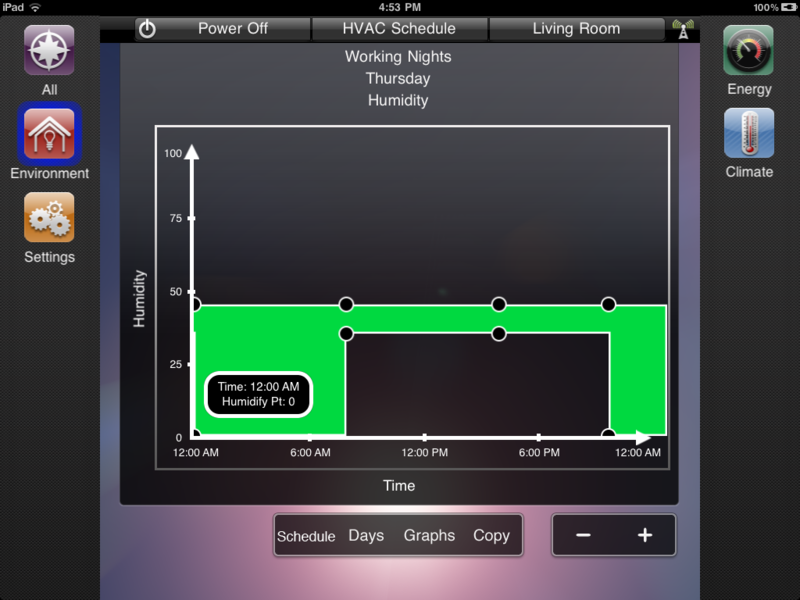 To schedule your humidity control device, tap on Graphs at the lower center of the screen. 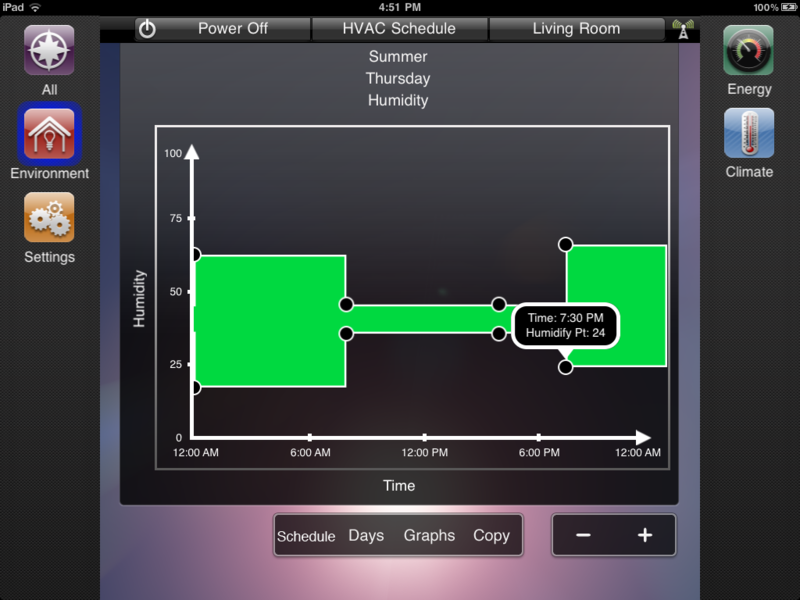 As shown below, this screen allows you to select Humidity. 2. 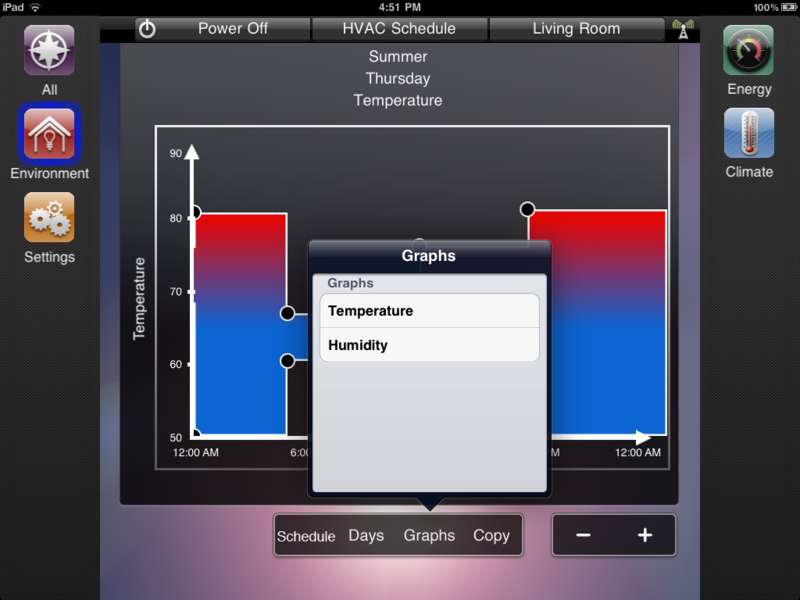 After selecting Humidity, the example screen opens. 3. Touch and drag the set points to schedule your humidity control device to turn on and off based on humidity and time of day. 1. After scheduling the temperature and humidity events, you may want to copy these schedules to all days of a week, weekdays, specific days and weekends. 2. To schedule your days, tap on Copy at the lower center of the screen. 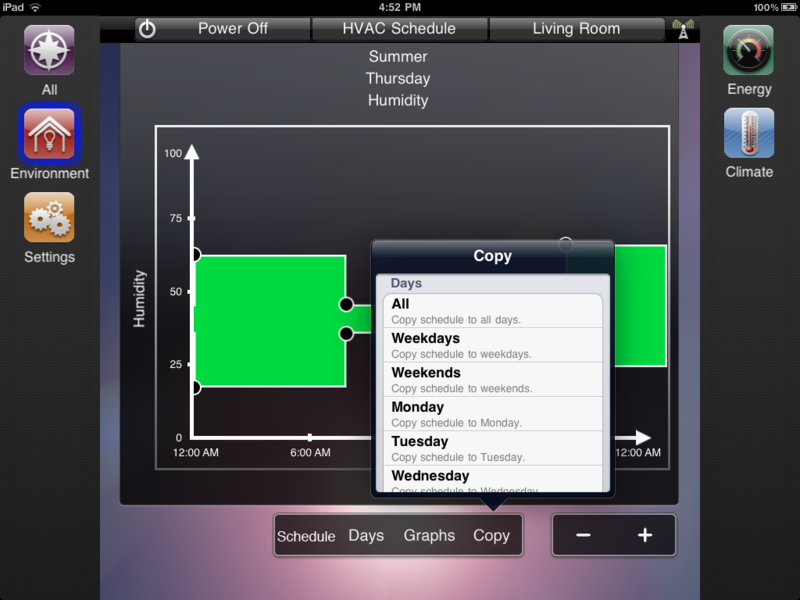 As shown below, this screen allows you to select the days you want to copy the schedule to.